We should visit what missed yesterday. The main attractions for the first day are concentrated under a single point: the 1. This way, today we would visit the more scattered spots. From this list, the must-do is Plaza de España, in point 2. Some minutes past 10 AM we’re at bus stop waiting for the 34 to start our journey. Our first visit makes us leaving the bus before Prado to get into Maria Luisa Park and explore it along with the Plaza de España (Spain’s Square). And here we are. It’s almost 11 AM when we’re enjoying the quietness of the park and its autumn beauty. We enjoy too some lakes and pools full of vegetation and birds. And through this nature we reach Plaza de España. It’s not the typical square in a city as it is not located between streets but within the park, so the people must come on purpose to this place. That’s clear when seeing all the people here is tourist or locals living from tourists. The place is spectacular, with a canal along all the half-moon of this building with a peculiar architecture in which front there is a space dedicated to each of the 50 provinces in Spain. In the middle of this semicircular square there is a circled fountain. The bridges, staircases, towers and mosaics around give a lot of good options for beautiful pictures. After watching absolutely all the provinces spots we walk slowly to the exit of the park, losing ourselves in a bunch of its corners through the rain of the falling leafs which are covering the ground everywhere. We take some drinks in a bar in the edge of the park and then take the same tram than yesterday to the same place: Prado to Cathedral. 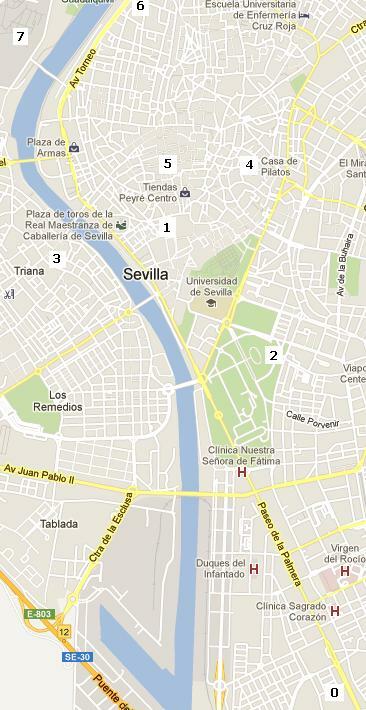 Our thought is visiting the Hospital of charity and then walking to the Maestranza and Torre del Oro. The visit time of the Hospital is 9:30 AM to 1:30 PM and 3:30 PM to 7:30 PM and we’re on time, just some minutes to 1 PM but, as tickets cannot be paid with a credit card and have no cash we need to go for an ATM. We are out of time once located an ATM from our bank and do some shopping in a cheap and small souvenir store in our way. 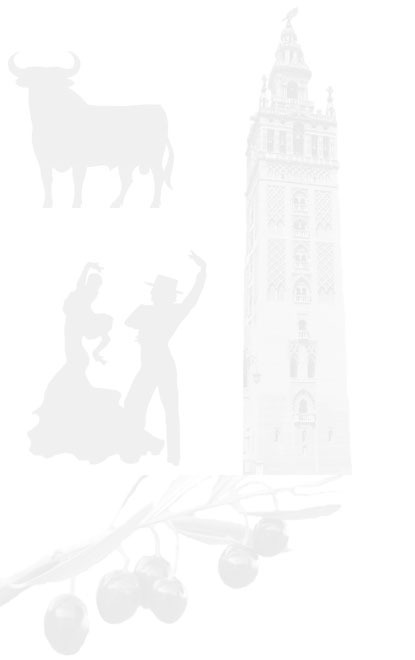 We change this visit to the end of the day and go on with our walk until Maestranza, the popular bull ring of Seville. There, we pose with the statue of Curro Romero and walk down the promenade along Guadalquivir’s riverside permanently guarded by the Torre del Oro (Gold Tower). At the tower’s feet is San Telmo’s Bridge, which goes to Triana quarter, where we’ve thought having our lunch today. Due to the big breakfast none of us is hungry, though. We get nice views of Guadalquivir’s riversides from the bridge. Its banister is full with padlocks couples put here, as in some other bridges in Europe, as symbol of the strength of their bound. In the other side we walk all along world famous Betis Street, which is full of restaurants. We get into one of them, but we’re not to lunch, we simply share a tapa of "pescaito" (little fish) while taking a couple of beer glasses while enjoying the beautiful view with Giralda and Torre del Oro appearing across the river. The big breakfast of this morning save us quite money as these places are expensive. We pay 13€ for one tapa and two glasses of beer in “Kiosko de las flores”. When we reach the end of Betis Street in Isabel II’s Bridge we decide to explore a little more Triana and end waiting bus 40. This bus takes us back to the East side of the river and we leave the bus to recover the visit to Hospital of the Charity, which is just here. We pay this time the 5€ per person as admission fee and, at the moment we cross the door, we’re amazed by the beautiful courtyard and the two fountains are here. The visit continues by going to the chapel, which results to be spectacular, with even a more overloaded altar than the one we saw yesterday in Salvador’s Church, and full of kind of obscure and medieval paintings. We still have one more place to see in here as there is an exhibition of nativity scenes with the highlight of one coming from Naples. The figures are old and precious, so no photos allowed here. We use the same bus stop we left 40 to get the C5, which is the one passing by almost all the highlights of our list. This trip is through the narrowest streets to Basilica of the Macarena. The sign says opening time is 5 PM, but this is not true today and people are accumulating in front of the place for an indefinite waiting for the doors opening. We take advantage of this time for taking some pictures at the ancient walls of the city, which still remain in front of the basilica. Around 40 minutes later, the doors finally are opened and we can go in and admire the figure of the popular Virgin of the Macarena. Inside, we can see Virgin with child and Jesus of the Sentence figures as well. Daylight time is getting over and visit to Pilato’s House must be for the last day. We wait for C5 bus again to return to Cathedral area, where we find the space in front of the City Hall really crowded. It seems something is going to happen here, so we get into the closest bar to eat some tapas. A Christmas light&sound show starts, which is displayed all over the City Hall’s façade. We go out to join the people and watching the end of the show and get shocked by how they play with some of the elements of the façade to giving the illusion they’re moving or distorting. When it finish people leave the place and we walk around until deciding to go back to our hotel by taking bus 34. We go out from the hotel for dinner immediately in the same place than yesterday: “El Rincón de Manolo”. We find a lot of people dressed as for a wedding – and maybe it is one – and the bar is crowded in a way that we’re very lucky on getting one table. We share 5 delicious tapas we never tasted before: 20€ in total, with wines and beers.